There was already a momentous evening at Headquarters on Friday, whenAogÃ¡n Ã Fearghail was elected to the role of UachtarÃ¡in-Tofa Chumann LÃºthchleas Gael, becoming the first man from Cavan to ever be elected to the position. On Saturday, UachtarÃ¡n Liam Ã Neill delivered the annual ÃrÃ¡id an UachtarÃ¡in. 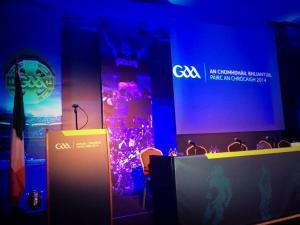 In it, he revealed the GAA's attention to pledge an additional â¬1 million to the development of hurling. Of the 64 motions down for discussion on Saturday, 49 were passed, two were approved by Central Council prior to Saturday, 9 were rejected and four were withdrawn from the clÃ¡r. One of the motions which attracted the most attention ahead of Congress wasMotion 58, known informally as the 'Anthony Nash' motion, relating to the taking of penalty, free and sideline pucks. However, this motion was removed from the clÃ¡r on Friday evening at Day 1 of Congress, with the GAA confirming that Central Council would provide an interpretation of the existing rule in due course. On Saturday, one of the most significant motions to be approved was Motion 35, proposed by the Rules Advisory Committee. Described by Ard StiÃºrthÃ³ir PÃ¡raic Duffy at a briefing ahead of Congress as âthe most radicalâ on the clÃ¡r, it will extend the match bans now enforced at Allianz League and senior inter-county championship level to the club scene. For more serious offences, time-based bans will remain in place at all levels. Motion 47, which proposed to reduce the age of minor to U17, was withdrawn after a lengthy debate and discussion from a large number of delegates. Among the other motions to be rejected were numbers 53, 54 and 55.Motion 53 proposed that match day panels be increased to 30 players,Motion 54 proposed that referees officiating at inter-county championship level should be from a different province to the two counties involved whileMotion 55 proposed that U21 inter-county teams be allowed to return to collective training on December 1.